Neodymium magnets are made from a rare-earth alloy of neodymium, iron and boron. Geometrically, these three elements form Nd2Fe14B tetragonal crystalline structure. 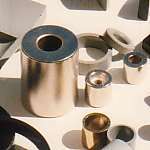 Its powerful strength, compact size and great affordability are favorable when selecting magnet material in many applications since its development and when it became commercially available. So, who, when and how was it initially invented? Driven by the rising cost of SmCo permanent magnets’ raw material, General Motors and Sumitomo Special Metals invented the Nd2Fe14B compound in 1982. GM invented and supplied melt-spun nanocrystalline isotropic Neo powder for bonded Neo magnets manufacturing, and founded Magnequench in 1986 which became part of Neo Materials Technology, Inc. and later merged into Molycorp. As part of the Hitachi Corporation, Sumitomo Special Metals developed and currently manufactures and licenses other companies to produce full-density sintered Nd2Fe14B magnets. Hitachi currently holds more than 600 patents covering Neodymium magnets. Due to the abundant supply of rare earth ores, China has become the world leading contributor of Neodymium magnets production. In 2010, 129,000 metric tons of rare earth elements were produced worldwide, with a minor non-Chinese input. As our world advances at great speed towards more cost effective, environmental friendly and higher production future, neodymium magnets are essential with their great attributions in innovative technology development in the fields of renewable energy, robotism, alternative fuel automobiles and many more. Great deals of efforts and advancements in material sciences will be required to allow Neodymium magnets able to withstand wider ranges of temperatures. Development in recycling technologies is crucial to relief the supply restrictions. It is vital to establish a strong network among academia, industries and governments for the advancement of Neodymium magnets in the future. 1. Chu, Steven. Critical Materials Strategy United States Department of Energy, December 2011. Accessed: 23 December 2011. 2. Jump up^ Peter Robison and Gopal Ratnam (29 September 2010). "Pentagon Loses Control of Bombs to China Metal Monopoly". Bloomberg News. Retrieved 24 March 2014.